Two Day Workshop in New York City! Coming up soon! 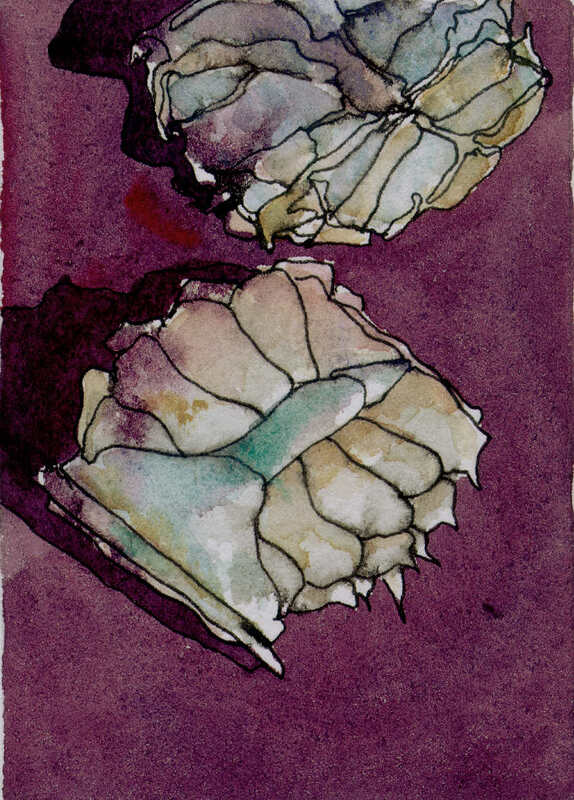 Both The Color Scheme Game Workshop and the Color Value Workshop is being offered back to back at the National Association for Women Artists in New York City on June 18th and 19th. Call the N.A.W.A. office to register (212) 675-1616. Space is limited to eight students. Since teaching the last workshop at N.A.W.A. I have had several personal breakthroughs with color, experimenting with more neutralized primaries and discovering gorgeous palettes. I also attended a fabulous workshop with Don Andrews. Again, I experienced several important breakthroughs regarding maintaining strong color when working with color value. I’ll be sharing these breakthroughs at the upcoming workshops in New York City. Click here for more info and materials list. Please Contact me if you have questions. Finally! 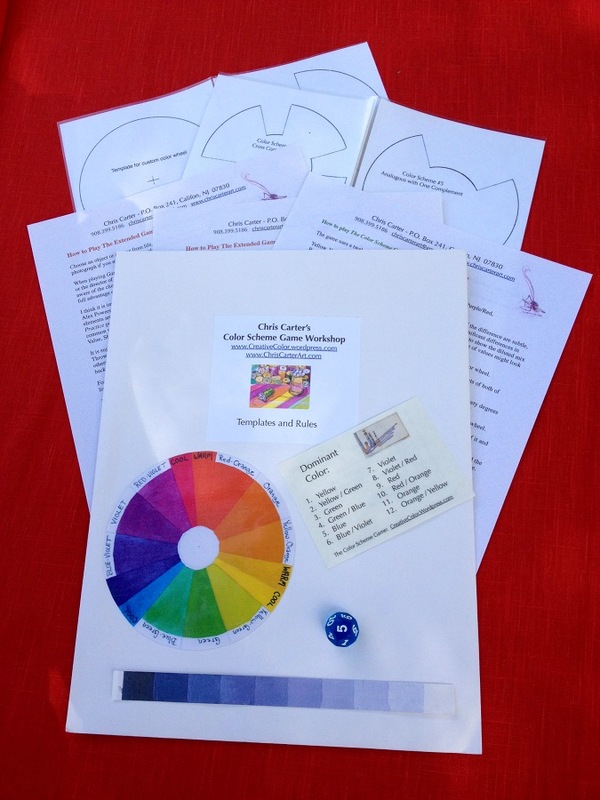 The downloadable, PDF Version of The Color Scheme Game is now available on my website! Die and grayscale are not included. Print on cardstock (available at office supply stores) and laminate with clear contact paper. Color scheme templates and custom color wheel templates make learning about color, color schemes and mixing colors with a limited palette a breeze! Directions for playing both The Color Scheme Game and the Extended Color Scheme Game are included. Contact me if you have any problems. (1. ) Matted, framed and dropped off paintings for solo exhibit at Connexions Gallery in Easton, PA …. done (2.) Picked up paintings from exhibit in Brooklyn … one sold! …. done (3.) Figure out how to film, edit and post short art videos for my students …. still a long way to go to get better, but done. The list goes on. Fortunately, all but a few items on the current Art Business list are checked off. Today the list will grow again, but last night I felt the pressure was off. I laugh when people envy my life as an artist thinking that I have all the time in the world to do exactly what I want to do. My life as an artist definitely is enviable, but not for that reason. What might be envied is the joy of curling up in a comfy chair, a warm breeze crossing the room, the sound of gentle rain with an occasional flash of lightning, fountain pen in hand, drawing two of my constant companions, the little garden angel given to me by my friend, Pete, and my skeleton, Henry. They keep each other company beside the fireplace in the living room. Why post this random though on Creative Color? Because I am still exploring the beauty of the neutrals I can achieve with that ugly pigment, Cadmium Red Deep! I began my intense study of color three, almost four years ago so that I could bring more full intensity, highly saturated color into my paintings. That mission has been accomplished and I am enjoying full intensity hues more than I imagined possible. 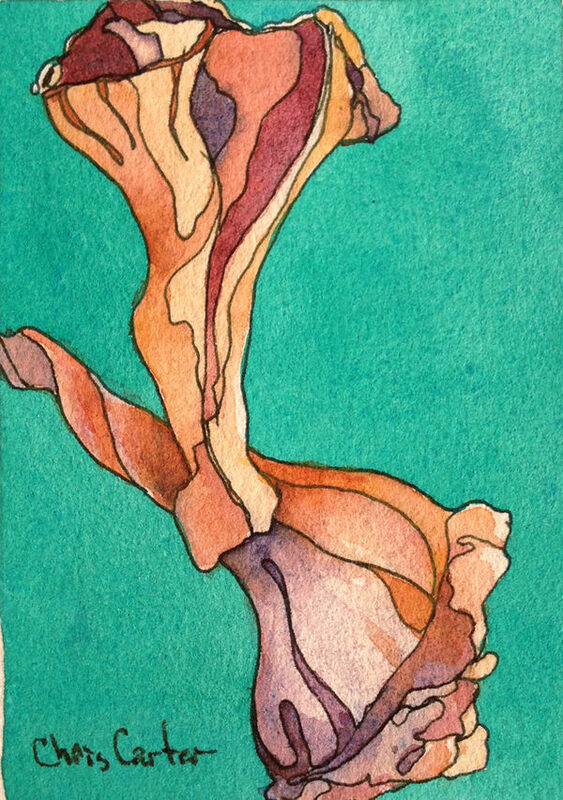 Now I am going deeper into the world of beautiful color and playing with neutrals. 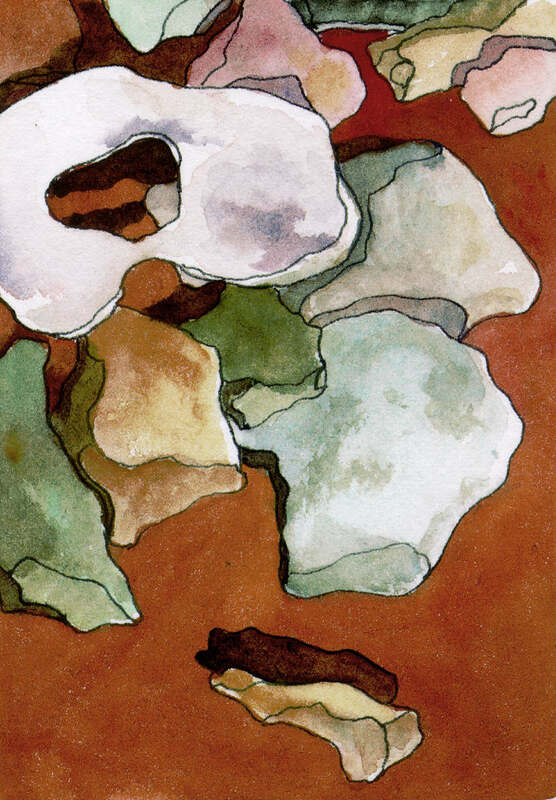 Without realizing it, most of my daily sketchbook paintings, though rich in color and value, do not use any of the three pigments in full intensity. All of the colors applied to the drawing are mixes of all three primary pigments in my limited palette of raw sienna, cadmium red deep and ultramarine blue. This is my third week exploring this palette and I like it more each day. Though I’m excited about whatever my next three primaries might be, I can’t seem to leave this palette behind. 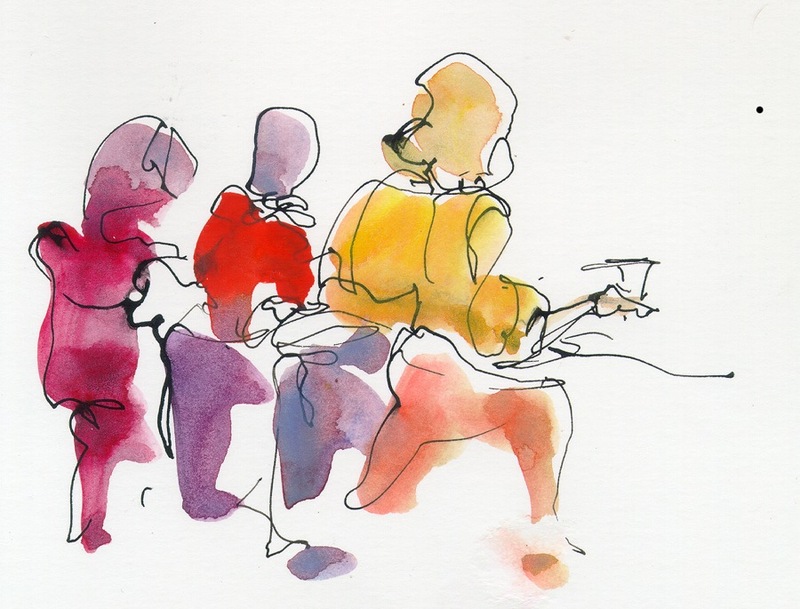 Image: Drawn first in ink with fountain pen, followed by watercolor. For those of you who live within driving distance of Santa Rosa, California …. I will be teaching workshops at both Village Art Supply (April 25th & 26th) and Riley Street Art Supply (April 27th & 28th) Please contact me if you would like more info! I’m coming up for air….. just for a moment…. I’ve been happily lost in the world of live music, art exhibits, travel adventures and learning how to make my own online tutorials. To top it off, it’s getting warmer and I’ll be back to drawing in my garden within weeks! 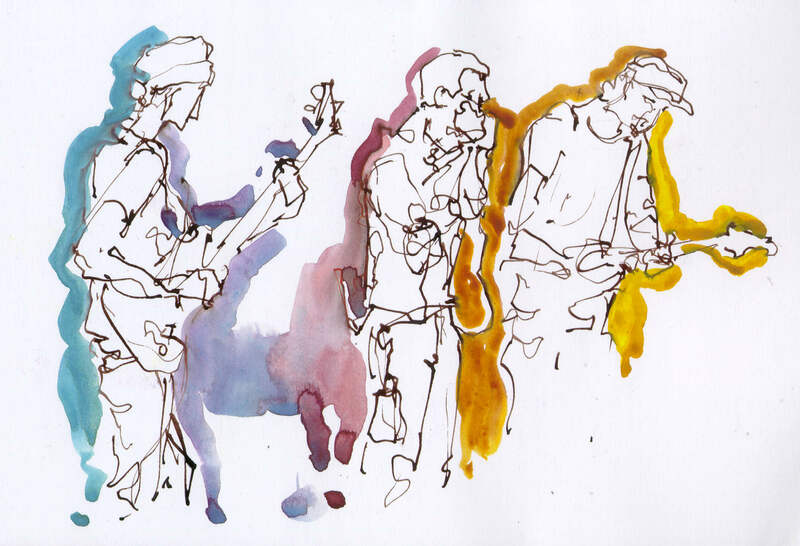 Paintings: drawn first in ink with dip pen followed by watercolor, painted during live performances. 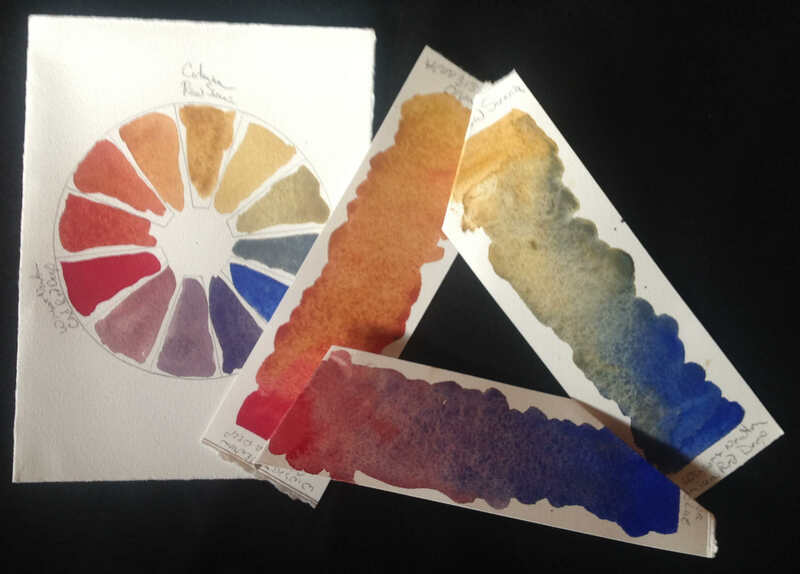 Video: demonstration of creating a color wheel for the color scheme game using raw sienna, cadmium red deep and ultramarine blue as my primaries. The hills surrounding Santa Rosa feel like kindred spirits. Live oaks and black oaks, solitary and in clusters, populate the erratic hillsides declaring their uniqueness and beauty. The winter colors are rich with muted blue/greens and red/violets, so different from the winter colors of New Jersey. 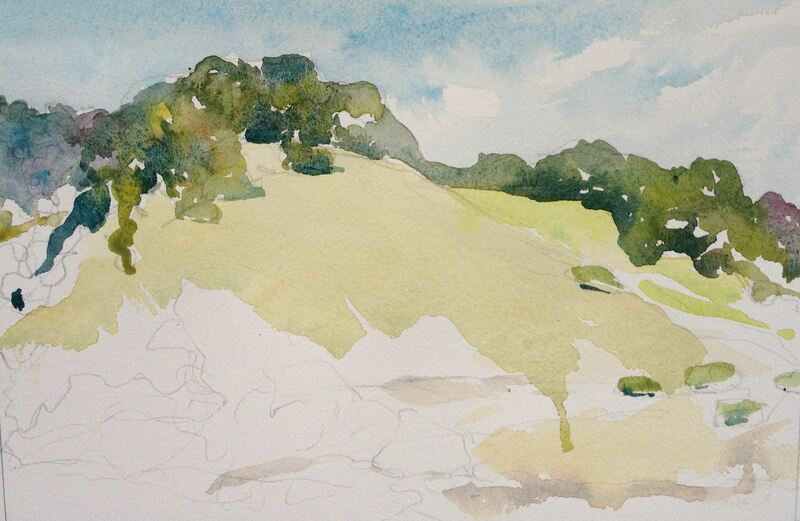 Sugarloaf Ridge State Park, Kenwood, CA – watercolor on Rives BFK printmaking paper. 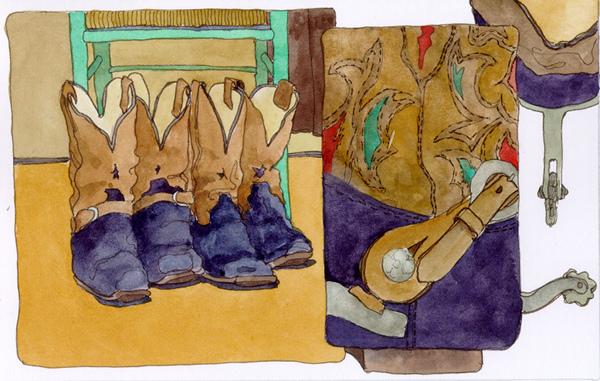 Limited palette: Winsor Yellow, Yellow Ochre, Cerulean Blue, French Ultramarine Blue, Carmine. A delightful day spent painting en plein air at Spring Lake in Santa Rosa, California! The day was overcast with occasional bursts of sunlight. I’m in heaven. 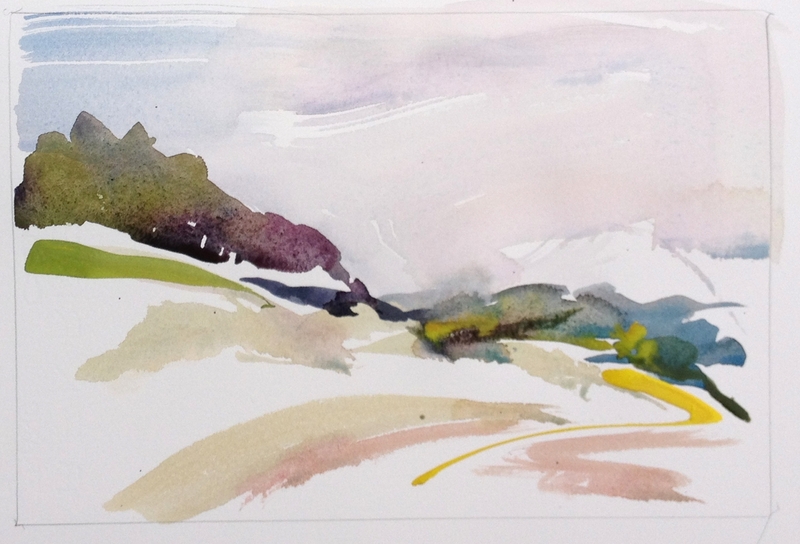 Watercolor sketchbook painting on Rives BFK printmaking paper – limited palette of cadmium yellow, yellow ochre, french ultramarine blue, cerulean blue, and carmine. Two beautiful, red, anjou pears jumped into my shopping cart and the grocery store. I played only the first part of The Color Scheme Game. 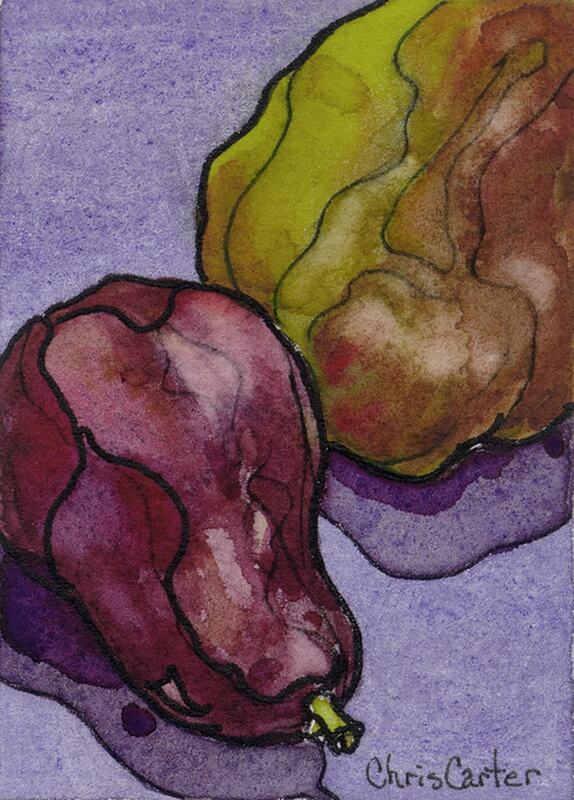 I wanted the Red-Violet of the pears to be one of my colors in my color scheme. I threw the die and ended up with a color scheme of Analogous with One Complement. I chose red/Violet, Violet, Blue/Violet and Yellow/Green. 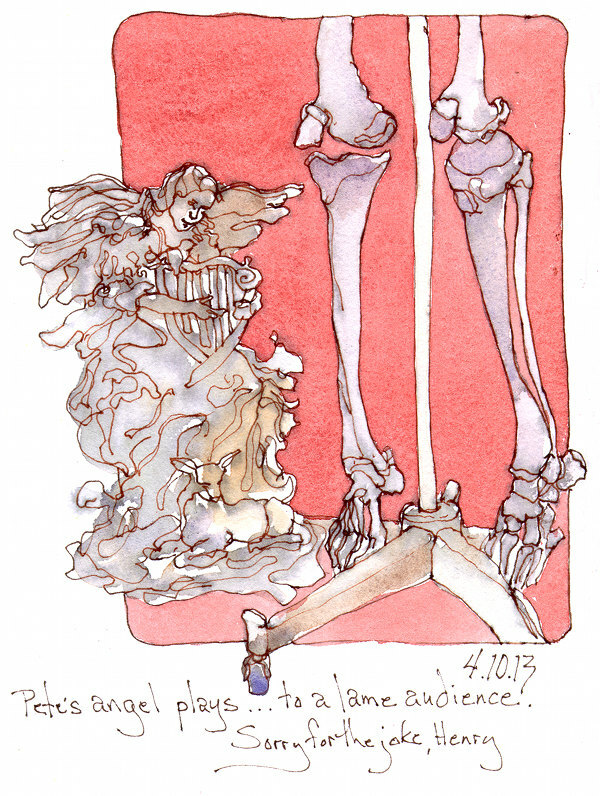 Sketchbook Drawing – Artist Trading Card: Drawn first in ink with fountain pen followed by watercolor.